This time, October fab bag is more of like a vertical pouch with no chain but a strap of cloth and a button to hold things together. The bag looks festive and suits this month's theme perfectly. The pink and the red go well together and the fluffy bag is decently sized. Along with the products, I also received the fab post, which is the fab bags magazine containing information regarding the products inside and some beauty tips and tricks too! 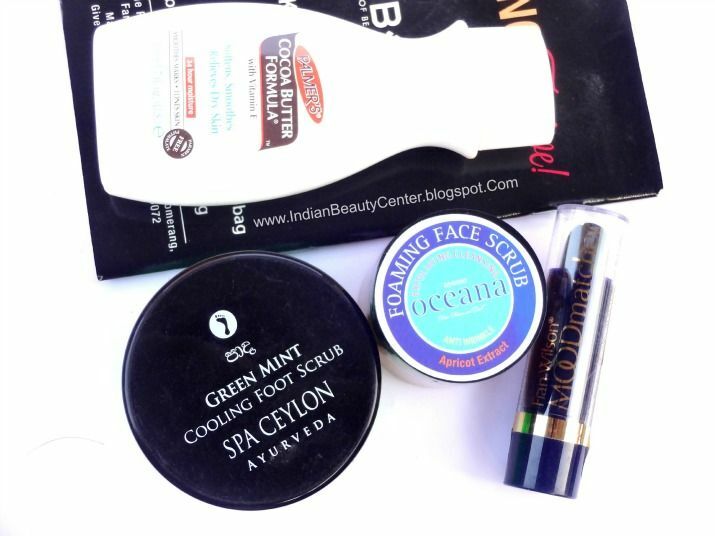 The first beauty product that has been grabbing eyeballs is the Spa Ceylon Green Mint Cooling Foot Scrub. The full-sized product is luxuriously priced at Rs. 1100 for 300ml. 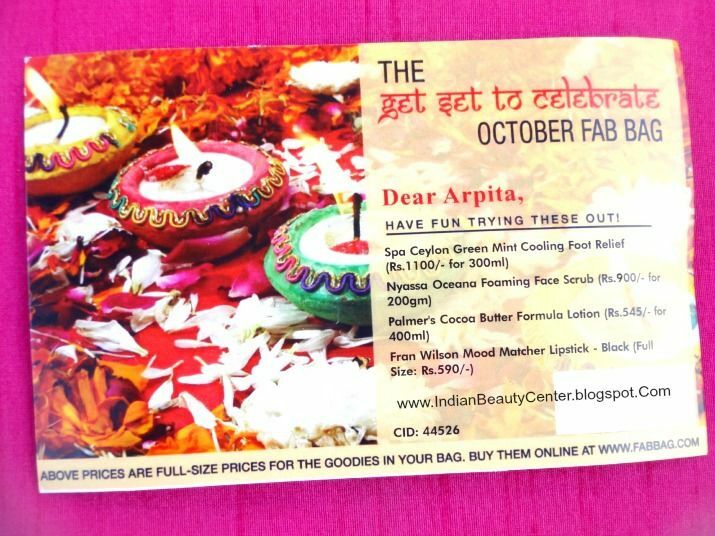 This is a new luxury ayurveda brand to me. It comes in a simple green tub packaging. The foot scrub claims to soften and revitalize the foot skin. It smells to me like "pudin-hara pearls", minty and refreshing. I received a 50ml deluxe sample of this product and thus cost of the foot scrub for the sample should be something around Rs. 183. Next, I received Nyassa Oceana Foaming Face Scrub in the FabBag. It is written on the pamphlet that it costs Rs. 900 for 200g of the body scrub, but you can get it for as low as Rs. 600 for 200g online. In the pouch, I got a 30g sample of this face scrub. This face scrub claims to provide the right extent of exfoliation that oily skin requires and you can use this on your body too! Using unitary method, this sample should cost something around Rs. 135 for 30g. I also received a very popular product, that I never got a chance to try until now. It's the Palmer's Cocoa Butter Formula Lotion with Vitamin E that claims to soften, smooth and relieve dry skin. I haven't tried this yet but am super excited. Those television advertisements do look tempting. I received a 50ml sample sized bottle of this body lotion. Full sized lotion bottle would cost you Rs. 545 for 400ml. Using unitary method, the cost of the sample is something around Rs. 68 for 50ml. 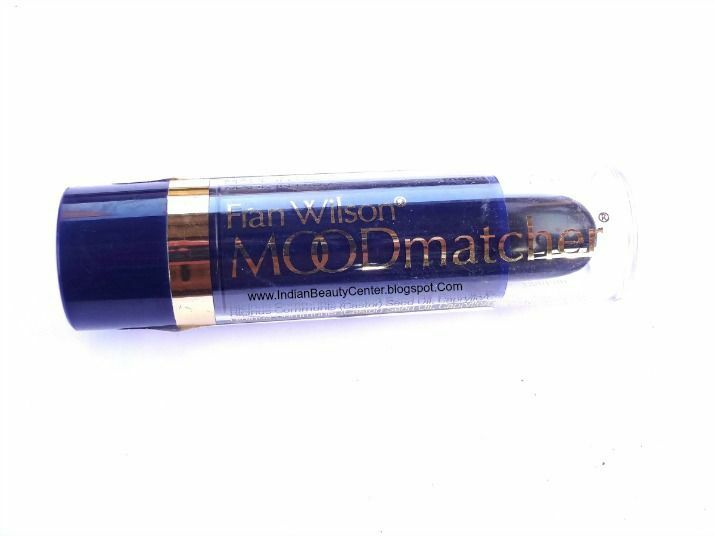 I also received the Fran Wilson Moodmatcher Lipstick in Black. 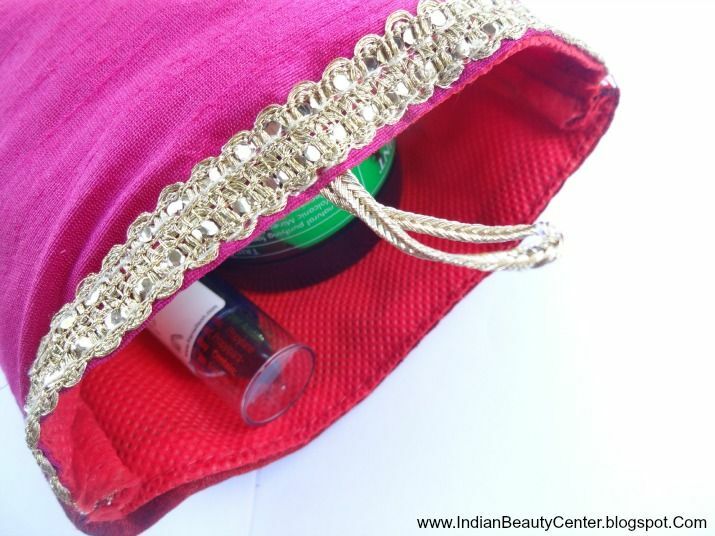 This time fab bag decided to offer its subscribers any one of their best seller products and so I chose this long lasting lipstick as I loved it from one of the previous fab bags. This time, it is the only full-sized product I received. It costs Rs. 590. The bullet color is deceiving as it applies as pink shade. It reacts to the body chemistry and is a color changing lipstick. 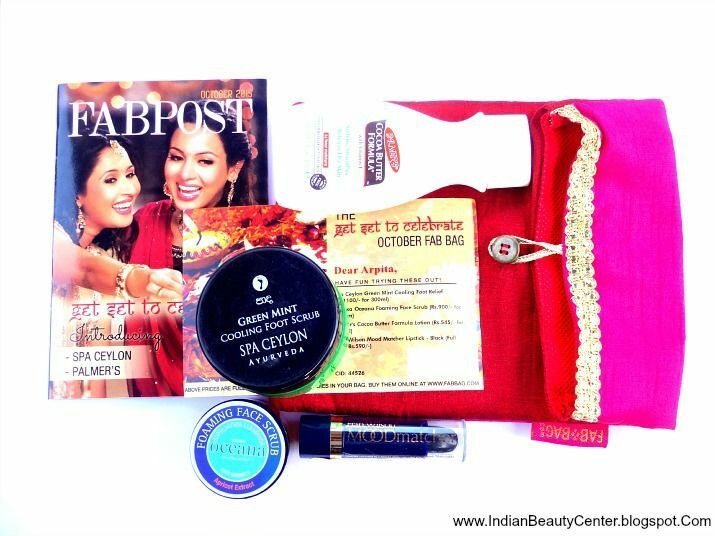 Although I was expecting more from this month's Fab Bag, it's not that disappointing. I am excited to try almost all the products. I already have the same lipstick and so I would be gifting this to someone. 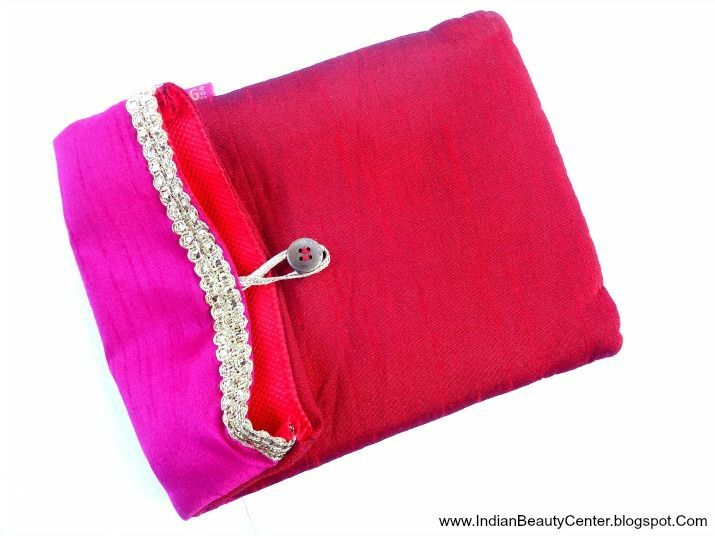 You should definitely go for this bag as you get products worth more than the total price paid for this.